The Garden of Eden isn't big enough for three people. Chiwetel Ejiofor, Margot Robbie and Chris Pine's characters find that out the hard way in "Z for Zachariah," an adaptation of a posthumously-published novel by Robert C. O'Brien ("Mrs. Frisby and the Rats of Nimh"). It's set in the aftermath of a decline-and-fall that seems to have included the use of nuclear weapons. Pockets of radiation are everywhere, even in remote rural areas, and the film includes sequences where radiation-proof suits are used and characters discuss underground bases and protocols. It's hard just to survive here; forget about rebuilding civilization. And yet that's exactly what the film's three characters try to do. The story begins with Ann (Robbie), a farm woman who inherited the place from her church-building saint of a father, finding the title character (Eijofor) and nursing him back to health. The first third or so is a two-character play. Zachariah gains strength and getting to know Ann, who's sweet but skittish and socially awkward (they both are—who wouldn't be under the circumstances?). They form a partnership that has the potential to become something else. Then Caleb (Pine), enters the picture. The addition of a third character, as ridiculously good-looking as the other two, injects a welcome note of tension into what was otherwise feeling like an exceptionally acted and photographed (in widescreen, by the masterful Tim Orr) psychodrama about really nice people. There are racial and religious overtones to the way that Ann, Caleb and Zachariah try to work together, and relate to each other, and especially in the way that Ejiofor plays Zachariah. The character is an engineer who became a success in his chosen field, found a mate that he loved dearly, lost everything in the cataclysm, and now finds himself having to compete with a younger, more cooly charismatic white man for the only available woman. To make matters worse, Ann's chemistry with Caleb is measurably hotter than the paternal, or at least big-brotherly, energy she shares with Zachariah. Race is never explicitly mentioned in the film, save for a pointed reference in one scene, but it colors, pardon the word, every suffering closeup of Zachariah as he watches Ann and Caleb flirt and trade hungry glances. As for religion: Ann's dad built the local church, and Zachariah advises tearing it down for raw material to create a wheel that will generate electricity from a local waterfall. As adapted by Nissan Modi and directed by Craig Zobel ("The Great World of Sound," "Compliance"), the movie is rather coy in how it frames Zachariah's (and later, Caleb's) enthusiasm for tearing down the church. It represents a destruction of the old order to create something new, but also (conversely) a rejection of the very patriarchal authority that both Zachariah and Caleb often represent to Ann, and that Ann's dad represented to her before the cataclysm. This is classic issue-driven science fiction mythmaking, in the tradition of "The World, The Flesh and the Devil," another movie built around an interracial triangle. The performers are committed to the director's vision, and cinematographer Tim Orr's careful framing and movement unveils the film's New Zealand panoramas, appreciating the textures of mountains and forests, and the way muted light fills up the interior of a ruined convenience store. There are problems, too, though. One is the studied nature of the performances. Some of Eijofor's choices feel overly deliberate here, for the first time I can remember. Robbie fares worse. Her "southern" accent and mannerisms are so polished it's hard to buy Ann as anything other than a technically excellent performance. There's nothing outwardly "wrong" about Robbie's work here, but it lacks grit and spontaneity. All you have to do is picture somebody more naturalistic and maybe American (a young Sissy Spacek, maybe, or Elizabeth Banks in "Magic Mike XXL") and you can see the missed opportunity. Pine fares best of the three leads, although to be fair he's playing the closest thing to an action hero, somebody defined mainly by his presence in a scene, the way he moves and reacts. He's great at that. He is also, for some reason (maybe his Americanness?) more credible as a drawling, scruffy, slightly dangerous backwoods American than his costars are in their roles. 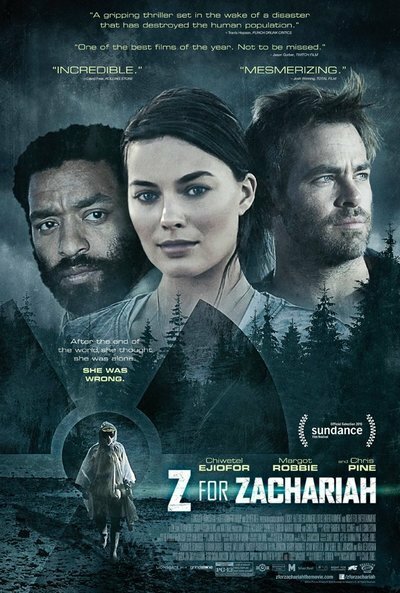 Worse, "Z for Zachariah" is ultimately too dramatically slight and brief for its ambitions, despite its sometimes labored myth-making script and visuals. And it's ultimately unwilling to truly commit to the idea of life after the end of the world as we know it. The production design, costumes, hair and makeup neutralize what the rest of the film is trying to accomplish. Ann's house looks too clean, too nice, too fussed-over, almost like a vacation home that a movie producer might stay in while convincing himself he was getting back in touch with the natural world. Caleb's been sleeping in the woods for weeks when we first meet him, but when he takes off his baseball cap, he's got a fashionable brush cut that looks like it might've been administered at a Beverly Hills salon. Zachariah's hair and beard are just as well-tended, and the signature light tan jacket that he wears in outdoor scenes is immaculately clean, and so crisp that it seems to have been ironed right before the cameras rolled. There's a shot late in the film, after Ann has been put through the emotional wringer, that's just so wrong in its visual particulars (she's resting her head on a tabletop that's obviously just been cleaned within an inch of its life, and wearing a fuzzy cable-knit sweater that might have come out of a gift box) that you roll your eyes when you should be weeping for everything that's been lost.